This long weekend we, like all Americans, remembered our fallen war dead. But we could not help also thinking about the atrocity of March, when Army staff sergeant Robert Bales murdered 17 Afghan civilians in their homes in the middle of the night. 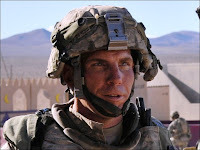 Speculations of traumatic brain injury (TBI) and posttraumatic stress disorder (PTSD) hit the press even before Bales was identified as the alleged killer. Katie Drummond, in the Danger Room at Wired, lays out some of the known and suspected connections between TBIs, PTSD, and violent episodes. Sharon Weinberger, writing in Nature, focuses on the challenges ahead for Bates's legal team and asks: "Can a traumatic injury explain a killing spree?" Lena Groeger, for ProPublica, finds serious doubts surrounding the $42 million Automated Neuropsychological Assessment Metrics (ANAM), a 20-minute computer test many soldiers take before redeployment. The common theme here, and in our sobering reflections, is the need for better diagnosis and more effective intervention to help soldiers who may suffer a lifetime with these conditions. Stay tuned to HyperbaricLink for more news on the state of the clinical evidence on hyperbaric oxygen therapy for TBI (and PTSD).